We saw this aquarium when getting around in Jeju Town after savoring abalone supper. There was a card with Chinese character at the aquarium. 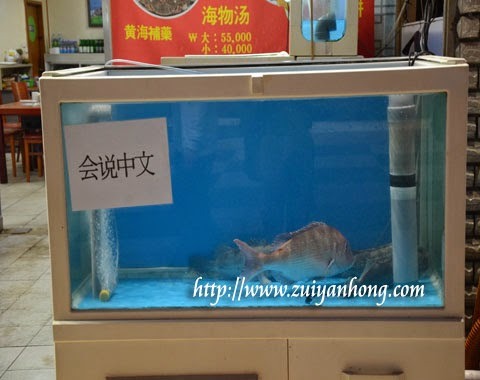 The Chinese word means "The Fish Can Speak Chinese". Don't get me wrong, the fish in the aquarium couldn't speak. Actually the card was for informing the customers that the restaurant waiters were able to speak Chinese. Due to a large number of tourists flooding Jeju Island, many restaurants in Jeju Island hire workers who know Chinese.